Michelle Gagnon is the bestselling author of thrillers for teens and adults. Her young adult PERSEFØNE trilogy (Don’t Turn Around, Don’t Look Now, Don’t Let Go) was nominated for a Thriller Award, and was selected as a top read by Entertainment Weekly, Kirkus, Voya, and the Young Adult Library Services Association. Her standalone young adult thriller Strangelets was a Junior Library Guild pick. She lives in Los Angeles with her family. "Effortlessly paced, full of heart, humor and horror, Gagnon revives the spirit of a classic while putting her own unique spin on the story. Janie is sympathetic and brave, the perfect lens for us to peer into a world of grandeur, secrets and dark lies. You can't help but lament the family Janie lost while also cheering for her to succeed in her new and strange reality. Charlotte Brontë would never have guessed that her classic fits so well with a Mean Girls twist, but the blend is addictive, fast-paced and haunting." 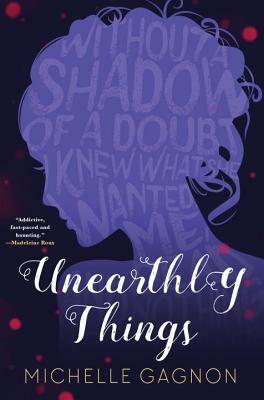 "A page-turning ode to Jane Eyre with a ghostly twist, Michelle Gagnon’s Unearthly Things haunts and delights. Orphaned Janie Mason uncovers the awful secrets hidden behind the seemingly perfect high society life of her new guardians, the Rochesters. A deliciously terrifying read with a heroine worthy of Charlotte Brontë’s classic." "The pace accelerates, suspense builds, and stakes mount . . . Jane Eyre has inspired retellings from literary gems to pallid retreads; Gagnon's version stands up to the competition, slyly toying with readers' expectation to surprising, entertaining effect." "A clever update of the Brontë classic . . . Fully rounded characters and abundant suspense help Gagnon’s novel hold its own amid other contemporary Eyre reimaginings." "Failing family fortunes, wails in the night, bizarre dreams . . . Teens who like gothic fiction will find this enjoyable."